I hope you are recovering from your Thanksgiving festivities. We had a lovely time with friends and we ended up eating way too much. But, it was so good and the company was precious. The perfect way to spend Thanksgiving when you are so far from home. 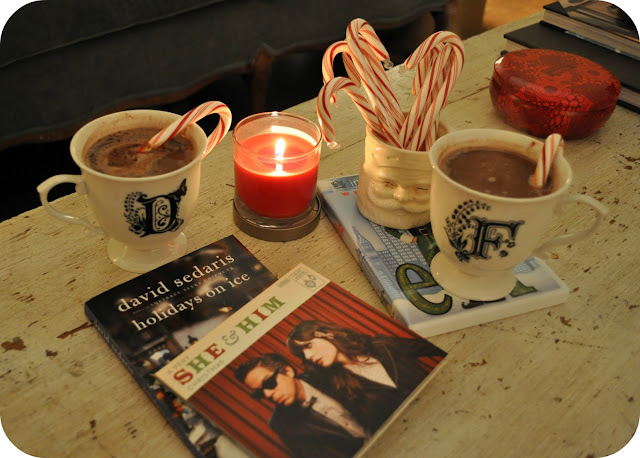 Today we started listening to A Very She and Him Christmas and reading David Sedaris's Holiday On Ice﻿. We are waiting to decorate but the holiday movie marathon starts tonight with Elf. I figure Elf is the perfect movie to get us in the Christmas spirit. What do you do to start the holiday season off on the right foot? Thank you so much for spending Thanksgiving with us. We loved having you here! Here's to a fun and magical Christmas season. I'm still trying to work out when to put our tree up. I think, as our wedding anniversary is November 30th...and Mr. Woo seems to have something up his sleeve I'll wait until the anniversary festivities are finished and then put the tree up and decorate in time for Baby Woo's shower! eeeeeeeeee! I will be busting out the Motown Christmas record for sure! I will have to try to find some egg nog I think since Bailey's will be off the list this year. I can hardly wait! xoxox! oh yumm, hot cocoa with candy canes sounds so delightful! we actually broke down an decorated last monday. we were like little kids haha. and ever since thanksgiving josh knows he's technically allowed to play christmas music so he'll turn it on every once in a while :) Elf is a cute movie, i need to watch that again soon!